A couple of weeks ago I asked my followers on Twitter why they tweet. I got a lot of responses. Some were solely to advertise, some were to advertise and “meet” new people, some were just for fun, and so on. Then I was asked why I tweet. Well, here is my answer. I don’t tweet to just talk about my business. I don’t tweet to make you feel like you need a product from me. I don’t tweet because I feel like I am super cool, cuz… I don’t think I’m that cool. More nerdy. ;) I tweet to connect with others. Whether they’re mothers, readers, business owners, single mothers, crafty or not. I love Twitter. It’s a great way to connect with people around the globe. I have Twitter friends in Australia, the UK,the Netherlands. And friends all over the U.S. I remember my husband nudging me to try Twitter 2 years ago, and I thought he was crazy. I remember wondering why in the world I would want to write in 140 characters what I am doing throughout the day. But, I ended up caving. And I am SO glad I did!!! I have met the most amazing people on Twitter. And I have become very good friends with several woman from Twitter too. In fact, I talk on the phone to these girls almost daily. And I love it! Who knew that Twitter could do that for me. When I need to vent, or get advice, or bounce ideas around, or just talk mindlessly, I will call at least 1 if not all 3 of them sometime during the day. My twitter friends are amazing in the way they live their lives, the way they support me and everyone else they are twitter friends with. It’s really just become an amazing community, and I love watching it grow everyday. If you haven’t signed up for Twitter yet, you should!! It’s free, and it’s fabulous!! In the same day I asked why my followers tweet, I also asked why they blog. I got pretty much the same answers from them as I did to why they tweet. I think that’s pretty interesting, and pretty consistent. I also blog for the same reason I tweet. To connect. I find all of you to be super encouraging, fun, supportive, and just down right awesome! This blog would be nothing without all of you!!! And when you leave me a comment on here or when you reply to my tweets it literally makes my day. I smile or laugh… sometimes cry. I share my life with everyone, and when everyone shares their’s with me… well. That just makes my day. I don’t find myself interesting or better than anyone else. I just find myself as a stay at home mom working a full time job for herself and loving the connection I feel to so many with just a simply interaction. If you tweet.. why do you? And if you blog … why do you? Yep!! 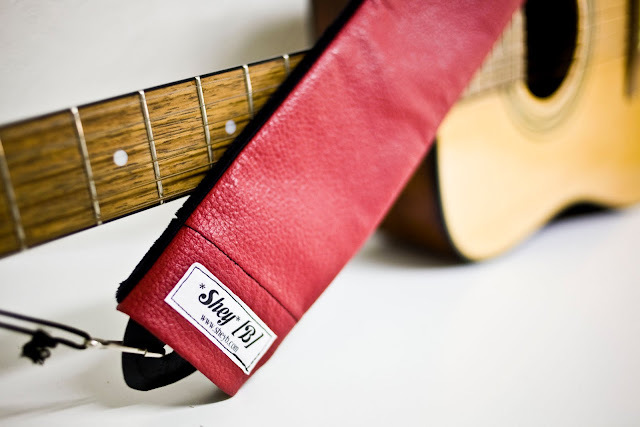 *Shey*[B] is now making guitar strap covers!!! And this specific guitar strap cover… well… click here to check out why it was made. :) I will be making them in more fabrics, and if you want to request a fabric, contact me! Would love to do one in any fabric for you! 1st off, Chris Daughtry? That is just too freakin cool! Why do I blog? I just blogged about this this morning! I blog for me, for release, for friendship. My mom blog is sep from my business photo blog (for which I purchased one of your covers and love it). I blog…well, for me. I blog for my family. It's a love letter to my husband, my son, my life. A testimony & honest look at our triumphs & struggles. I blog to raise awareness & sensitivity to miscarriage & postpartum disorders. I blog to connect. I blog to stand out in a world where sometimes, I wonder if my life matters. & my blog screams back at me, YES, YOU MATTER. It's an amazing feeling. When I first heard of twitter – I thought, "Why would people really want to use that? What's the point?" — and, I'll admit it – I thought, at first, that it was a bit geeky/nerdy. LOL!! Well… you know I don't think that way anymore! I love twitter. I love how I can be "keeping up with" so many in real-time… I am addicted. I love it! …you really going places, Shey! Soon, you'll be a celebrity in your own right! LOL! The talent just keeps coming! CONGRATS on THEE Daughtry! How cool are you?! You can guess what I'll say next right?… H–E! I was right, haha! Wow! So awesome that you made a guitar strap for Daughtry! Great idea! I am going to see him live in May…sooo excited! LOVE the new straps! gorgeous!!! !